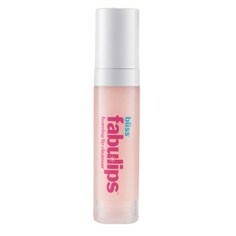 Bliss Fabulips Foaming Lip Cleanser removes everything from lipstick to lunch. Unique bubbly formula foams up fast to lift surface impurities. helps break down waxes and oils to gently cleanse lips and lift away impurities such as dirt, food residue and makeup. helps to soften and smooth lips. I haven't seen anything like this before but it is really nice to use and leaves a lasting effect. It is only a small investment so I would suggest a try. I thought this was going to be a bit gimmicky but once I used it I was really impressed. It left my lips feeling like when I was young and lipstick smooths on easily after lips are cleansed with this. "I haven't seen anything like this before but it is really nice to use and leaves a lasting effect. It is only a small..."